Dissolve yeast in warm water in mixing bowl. I use my KitchenAid mixer so I can use my dough hook for kneading. Add honey. Turn on mixer. Add whole wheat flour, salt, olive oil. Let mix some then add in bread flour a little at a time. It should come together. If not add flour if too sticky or a water (1/2 T at a time). The dough in the picture is a little dry so I added water. Roll dough into ball and place in oiled bowl. Place damp cloth or paper towel on top. (Mine fell into bowl in this picture. You'll do better I am sure.) Let rise in warm place for about 45 minutes. Divide dough into 2 or 3 pieces depending on if you are doing regular size loaves (2) or medium size loves (3.) 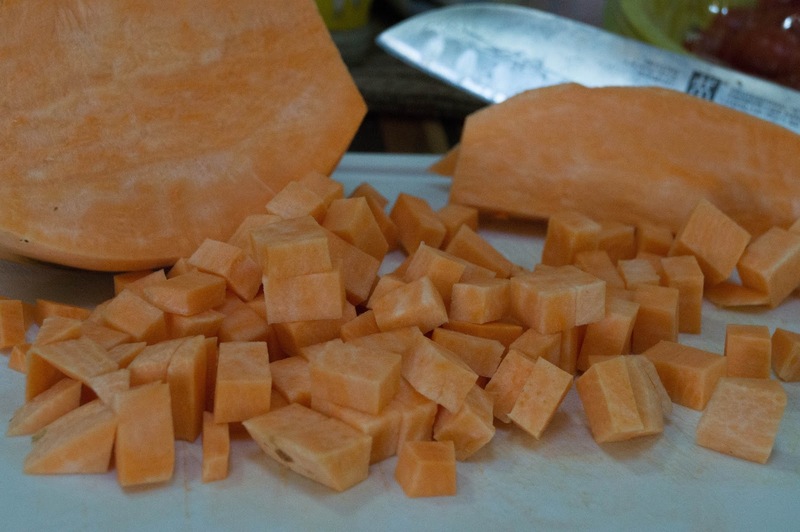 Roll out into a rectangle a little wider than the length of your pan and about 1/2" thick. Mix a little cornstarch and cinnamon in some pure maple syrup. Spread it on the dough but not quite to the edges. Don't make it soupy or it will all squeeze out the other end! Mix it up. No one wants to bite into a bunch of cornstarch. Roll up from the short side, bringing edges in like a burrito to keep in the liquid. Pinch to seal and bake. The cornstarch will keep the liquid from escaping. Let rise for another 45 minutes. Bake at 375 degrees for 25 to 30 minutes for regular Or 20 to 25 for medium. Use a serrated knife to cut this oh so moist bread. I dare you to wait until its cool to dig in! This bread stays moist for days and I have even experimented with 5 cups of a 1/2 fine 1/2 coarse wheat mix and 1 to 1-1/2 cups of white. Still moist days later! You can freeze this bread whole or sliced. Thawed, tastes just as good as fresh. Make it into French Toast!! Welcome to Foodie Friends Friday Independence Day Red/White/Blue Foods Party!! 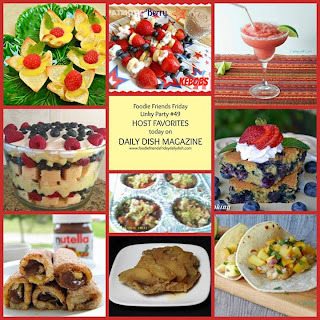 Last week's recipes that received the MOST VOTES. 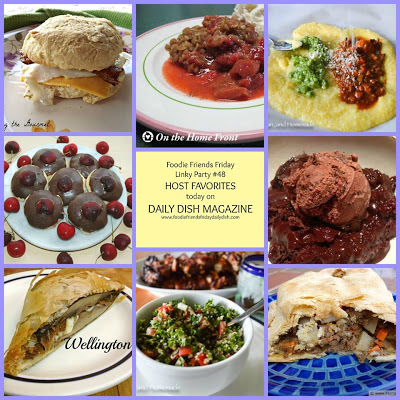 I was honored to have my Fruit Swirl Coffeecake, chosen as one of them! In a small bowl mix together all the ingredients. Pour into a zipshut bag and place meat inside Marinade for at least 2 hours. Remove from fridge at least 15 minutes ahead. Flank is great grilled over high heat. For my thicker steak each time I moved it for the marks I put it on a new part of the grill but kept the heat medium. My family (not me!) prefers theirs well done so I go a little slower. You can baste with the marinade as you cook the meat as long as you put it in a pan and bring it up to a boil since you had raw meat in int. Slice thin to serve. Would be awesome in a sandwich! Chef Gaby also says you can slice thin and use as a stir fry, just be sure your wok is smoky hot!! What are spirited vinegars? 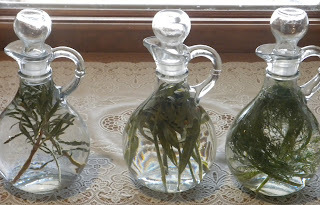 They are vinegars infused with herbs, spices, flowers or fruits. You can read more about spirited vinegars from Mountain Rose Herbs. Chef Gaby introduced them to me. You can use them a few different ways. The most common is marinades and salad dressings. 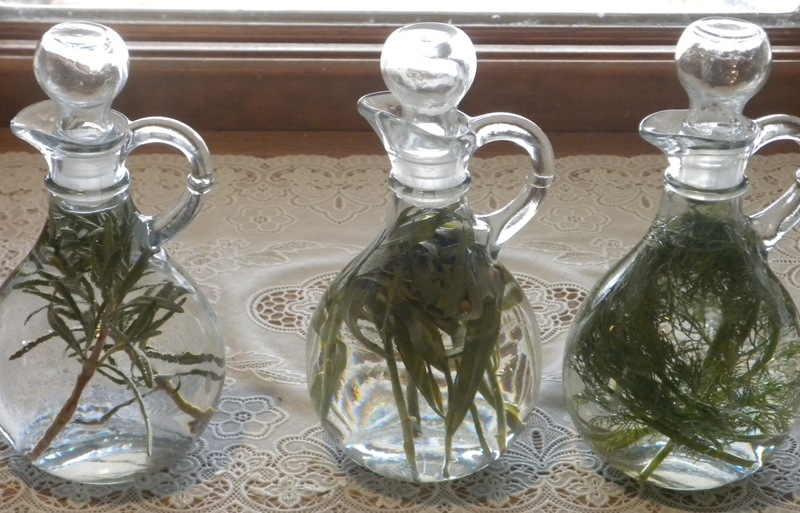 In this photo are L-R, Rosemary Vinegar, Coriander/Tarragon Vinegar, and Dill Vinegar. They need to infuse for at least 2 weeks. 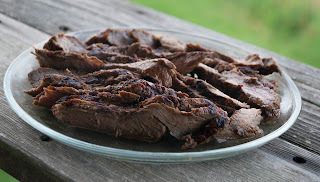 Check out the Grilled Tarragon Marinated Steak for one way to use a spirited vinegar. 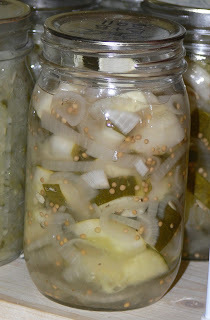 This is Aunt Martha's recipe for some easy pickles!! I think these taste just like pork and beans but with bacon (which is technically still pork) so my husband came up with the name Bacon Beans but to take out the "o" and make it an apostrophe. Place beans in large pot and cover with water. Bring to boil and boil for 2 minutes. Turn off heat and let sit covered for an hour. 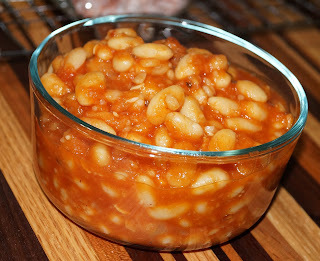 Drain the beans and return to pot. Cover with at least 2 inches of water and return to boil. Simmer, covered, until the beans are soft. Takes approximately an hour. Drain. Meanwhile in a smaller pan cook the bacon until nearly done. Drain off most of the fat. Add onions. Cook until golden brown and soft. Add red pepper flakes and sage. Cook for 1 minute. Add tomato paste, honey, chicken broth, and tomato sauce. Stir to combine and then pour into beans. Stir well. Cover the pot with an oven proof lid or two layers of foil. Cook at 325 degrees for 1-1/2 hours, removing cover for last 15 minutes. 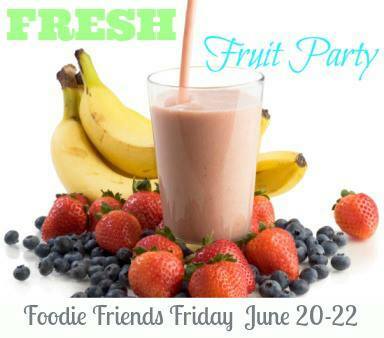 Welcome to Foodie Friends Friday Fresh Fruit Party! Last week's recipes that received the MOST CLICKS. I was honored to have my dad's favorite dessert, CHERRY TORTE, chosen as one of them! 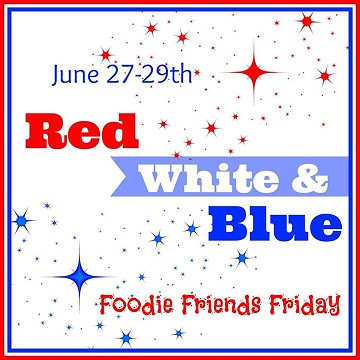 Thank you to everyone for making last week's Foodie Friends Friday Sweet Treats party a huge success. Did you see all the recipes that caught OUR attention last week? 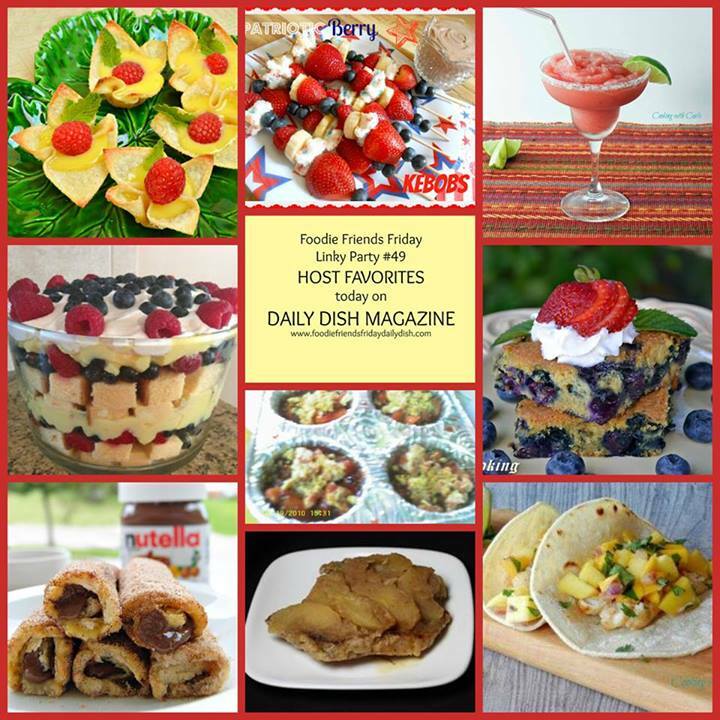 Check out the Host Favorites on the Daily Dish for links to all the recipes. In medium size pot add the sage (rub between your fingers to break up as needed), thyme, flour, milk, and chicken broth. Whisk to disperse the flour. Dump in carrots, sweet potatoes, and onions. Bring to boil, turn down to simmer stirring occasionally. Simmer until veggies are soft. 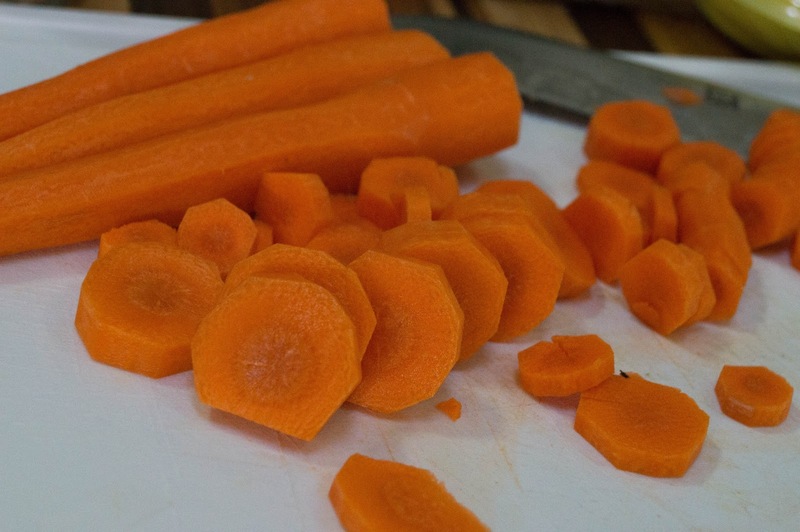 My carrots took longer than the sweet potatoes so check them. Slicing them thinner than I did will speed them along. Look how the soup starts to turn a beautiful orange. Takes about 30 minutes. Be sure to stir here and there so it doesn't stick to the bottom. 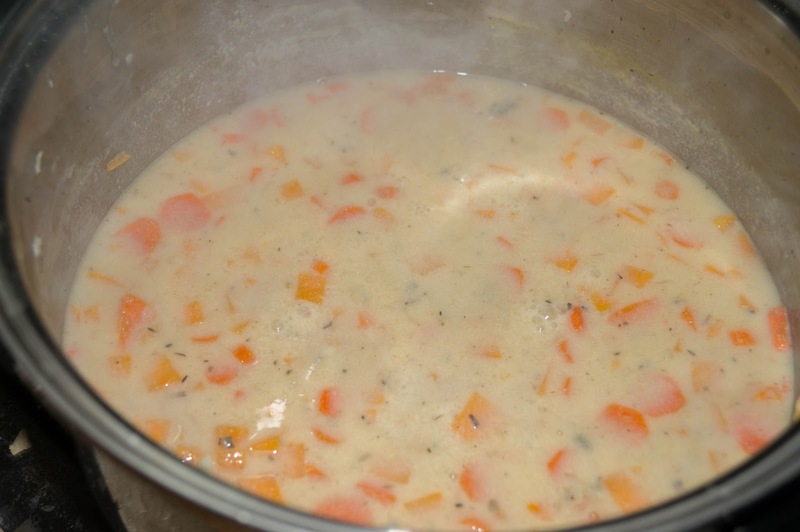 Your chowder will lose a little liquid and thicken up nicely. Add spinach (make sure to the cut the opposite way so they are not long strips) and corn and cook for 5 minutes more. My husband likes meat in his soups so he added some grilled chicken to his. ***Use vegetable broth for a vegetarian version. So, what to do with all that homemade sauerkraut? Ask Chef Gaby! After trying my homemade sauerkraut and declaring it was the best she had ever had she emailed me this recipe. A modified version of Paul Grimm's version. Melt 2 tablespoons of the butter in a large skillet and cook the onion until translucent. Add the juniper and the bay leaf followed by the kraut. Cook down until the kraut is hot. While that cooks, combine the cream, milk, eggs and season with salt and pepper. Remove bay leaf and transfer the kraut mix into a 9x13"baking dish. Pour over the custard mix. Meanwhile melt the remaining butter and toss with panko crumbs. Sprinkle crumbs on top and baked an additional 15 minutes until the crumbs are golden brown and the gratin doesn't jiggle when wiggled. **The recipe called for putting the buttered Panko crumbs on at the beginning of the cooking time but I was afraid it might burn so I added them later.